No exaggeration, having finished this Shrimp Rice Noodle Roll recipe or xiā cháng fěn in Mandarin (虾肠粉), I feel like I just finished a triathlon lasting many years, except all the pedaling (with whisks), running (around the stove) and swimming (in endless bowls of liquid rice mixtures) took place right here in our kitchen. 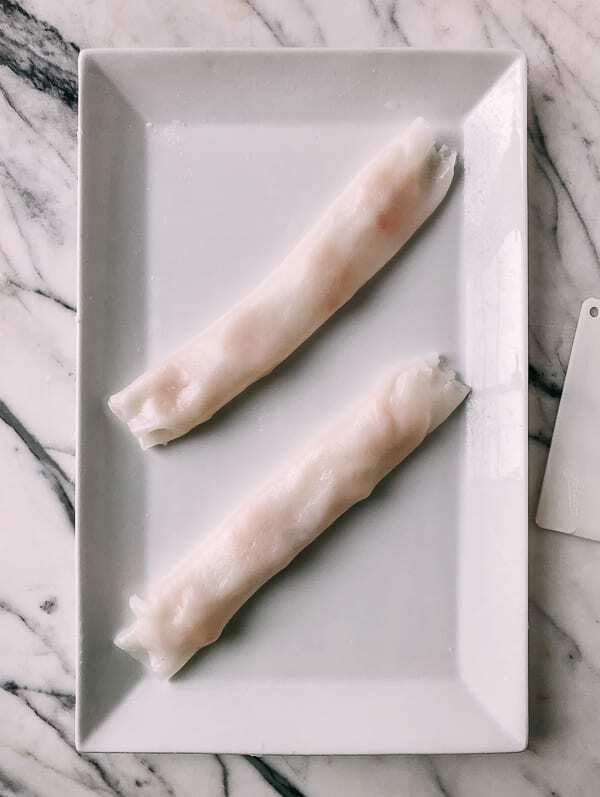 After a strenuous recipe-testing saga, I feel good about sharing this Shrimp Rice Noodle Roll recipe––one I’ve worked on for the past three years. Wish you all could have been there in our kitchen to witness the drama and excitement. Now, I feel a heavy weight has been lifted––I even took two days off from blog work afterwards as a reward to myself. 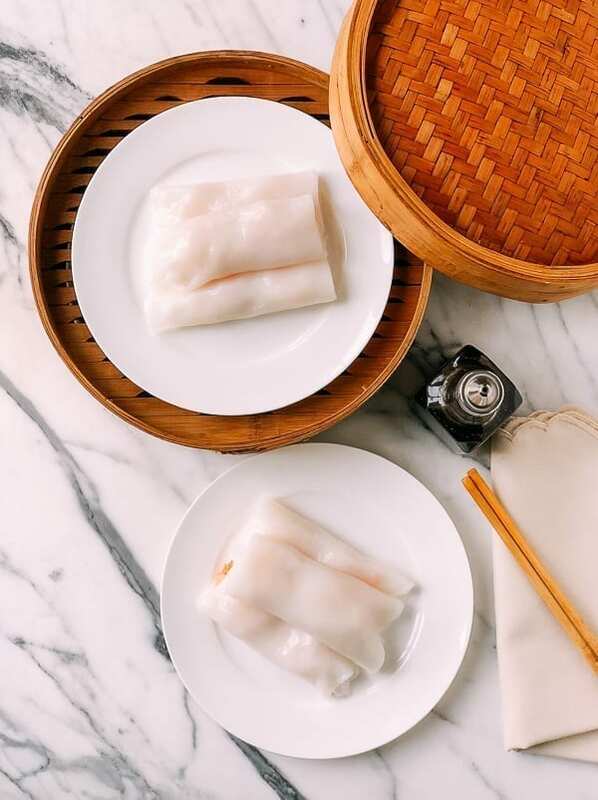 What are Shrimp Rice Noodle Rolls, or ha cheung? 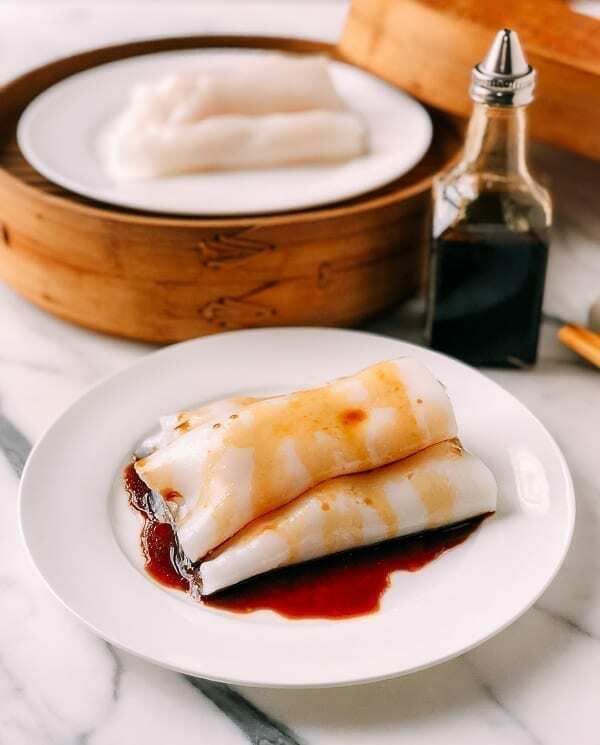 Shrimp Rice Noodle Rolls, or “ha cheung” (Cantonese) are a dim sum classic, and consist of light rice noodles, or cheung fun, wrapped around plump shrimp (either whole or pureed), doused in a sweet soy sauce. 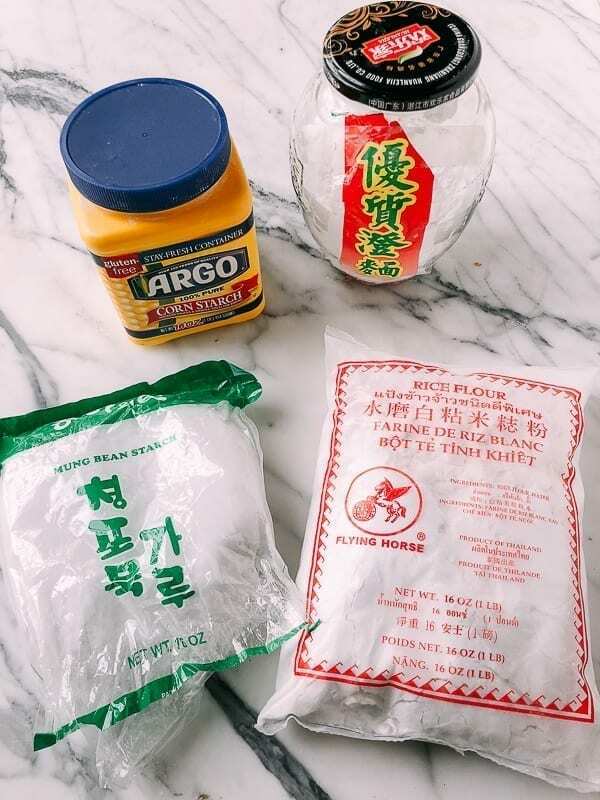 It’s always a favorite at dim sum restaurants, and I’m happy to have cracked the code on a recipe for the home cook. Pre-cooking the shrimp before adding them to the rice roll proved to be key, as the rice batter is so thin that the rice noodle has to be cooked before the shrimp can be placed on top. 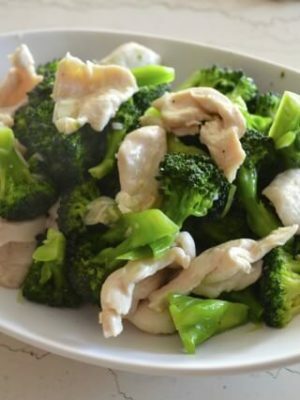 I tested this recipe many times steaming the rice noodles directly in a pan, which resulted in a rough finish. After studying numerous restaurant videos to see their methods, I found that steaming the noodles on cloth is infinitely easier. I cut up a white cotton pillowcase and followed their steps. What a difference! 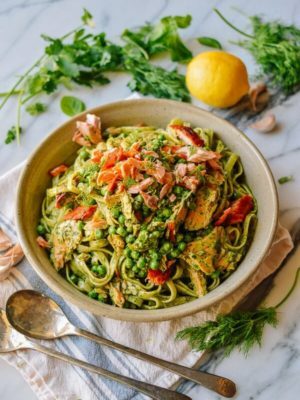 This recipe calls for mung bean starch, which is a rarely seen ingredient (and many rice noodle recipes don’t call for it). However, this starch is the main ingredient in glass noodles, and I think it adds a nice texture and chewiness. The dry ingredients in the batter will settle to the bottom of the bowl, even after being well-mixed. It must be stirred up every time before being added to the pan to steam. This is VERY IMPORTANT! The shrimp marinating steps will make your shrimp more plump and crunchy. Skip only if your shrimp is extremely fresh. 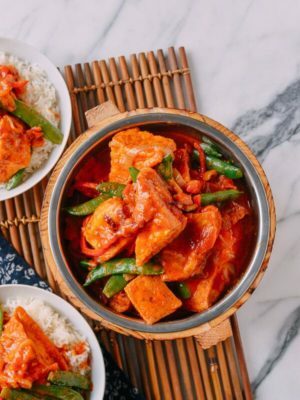 A metal cake pan, sheet pan, or any heat-proof flat bottomed pan with a rim that can fit in your wok and float on top of simmering water, ideally square or rectangle-shaped. A plastic or silicone dough scraper. 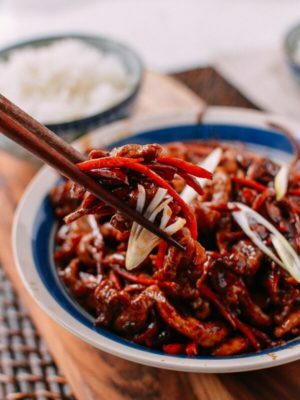 Though I’ve seen Chinese chefs use cleavers for this purpose, the plastic dough scraper is more user-friendly and does not stick to rice noodles. A spatula can also work in a pinch. If you use a metal utensil, brush it with oil to prevent it from sticking to the rice roll. A large wok or steamer with lid (find out more about how to set up a steamer here) that will fit your pan. 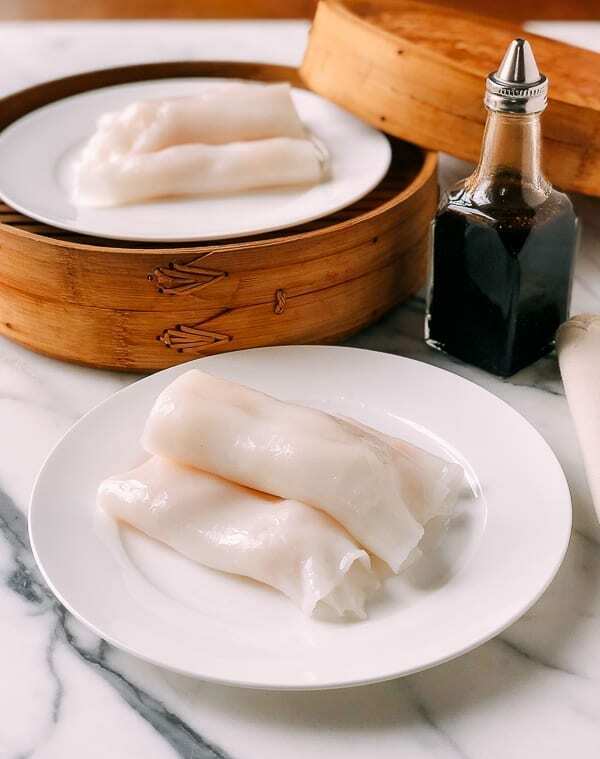 There are many Shrimp Rice Noodle Roll recipes out there, but they rarely come close to our dim sum expectations. I know because I have tried, tested, and adjusted plenty of them. I do hope this recipe will change that. 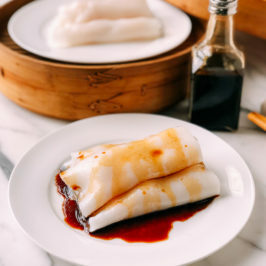 I hope many of you give this recipe a try, because who doesn’t love this popular Cantonese dim sum? If you do try it, let us know how it went in the comments! 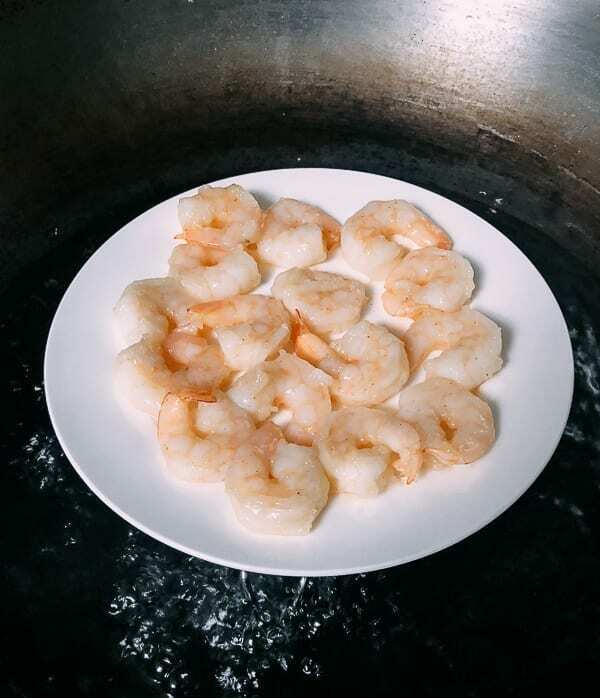 Toss the cleaned shrimp with 2 tablespoons water, 1/2 teaspoon sugar and 1/8 teaspoon baking soda. After the shrimp have been coated, cover and refrigerate for 2 hours. 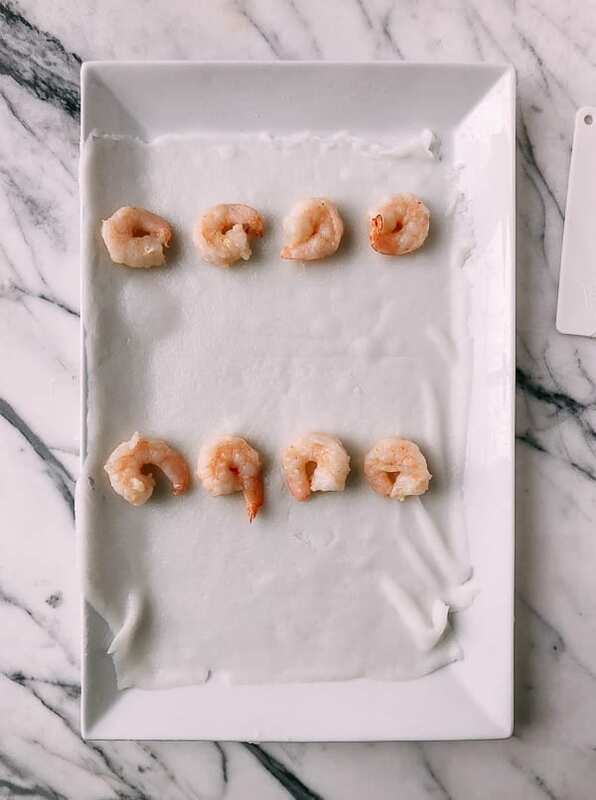 After 2 hours, rinse the shrimp under a gentle stream of cold running water for 5 minutes to wash away the sugar and baking soda and pat thoroughly dry with a paper towel. This will greatly improve the texture of the shrimp! 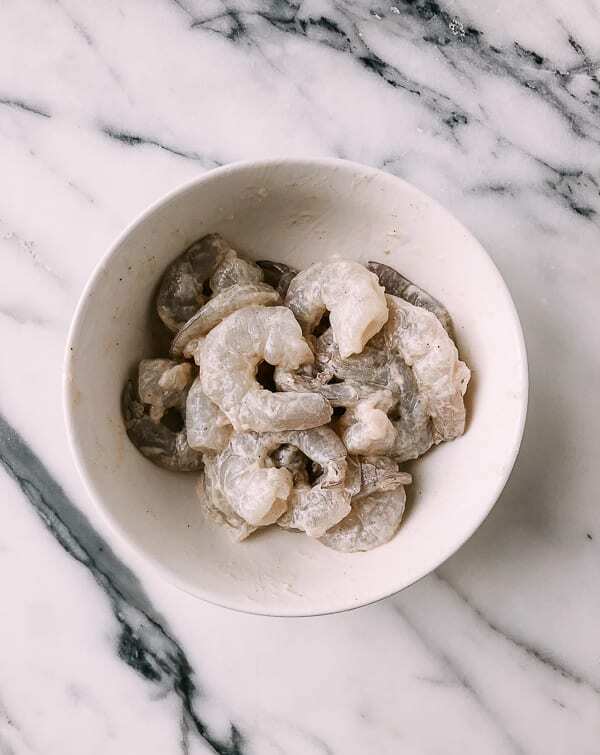 Marinate the shrimp with 1/4 teaspoon sesame oil, a pinch of salt, 1/2 teaspoon cornstarch, and 1/4 teaspoon ground white pepper. Cover and return to the refrigerator while you prepare the rest of the ingredients. 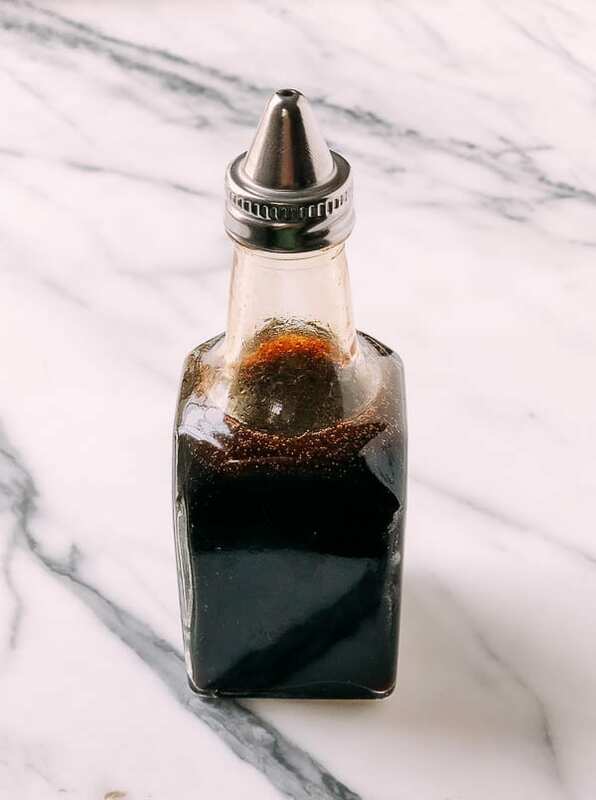 Prepare the sauce by adding all the ingredients (1 scallion, white part only, 1-inch piece of ginger, 2 ½ tablespoons light soy sauce, 2 teaspoons dark soy sauce, 5 teaspoons sugar, 1/3 cup water, 1 teaspoon oyster sauce, 1 teaspoon oil, and salt to taste) to a small saucepan over medium low heat. Heat the sauce until it begins to simmer, and turn off the heat. Cool completely and remove the ginger and scallion. You can store this sauce in the refrigerator for up to 2 weeks. Combine rice flour, mung bean starch, wheat starch, cornstarch, and salt in a large mixing bowl. Add the water and stir for at least three minutes until dry ingredients are well dissolved. Set aside and allow time for any air bubbles to dissipate. Soak the cotton cloth in water so it’s completely saturated. Pre-boil water in your steamer with the lid on (more on how to set up a steamer here), and make sure your steamer fits the flat-bottomed pan you will use to steam the rice noodles. 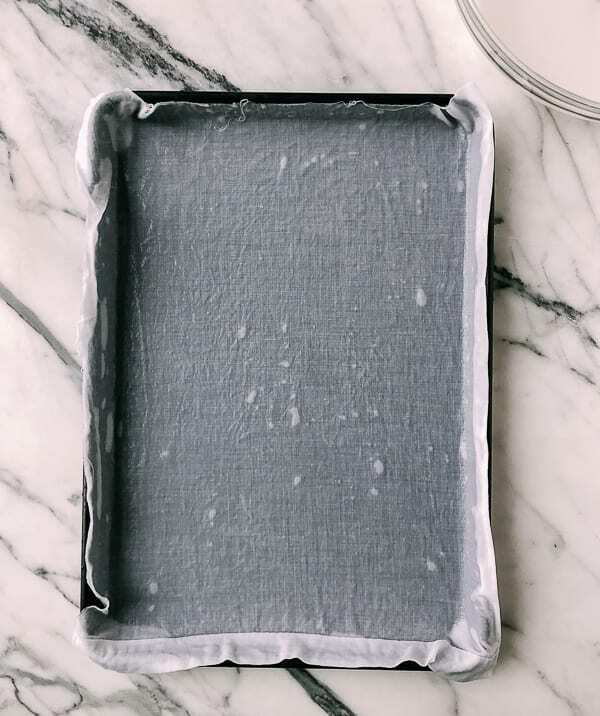 I used a 9 x 13 non-stick sheet pan. 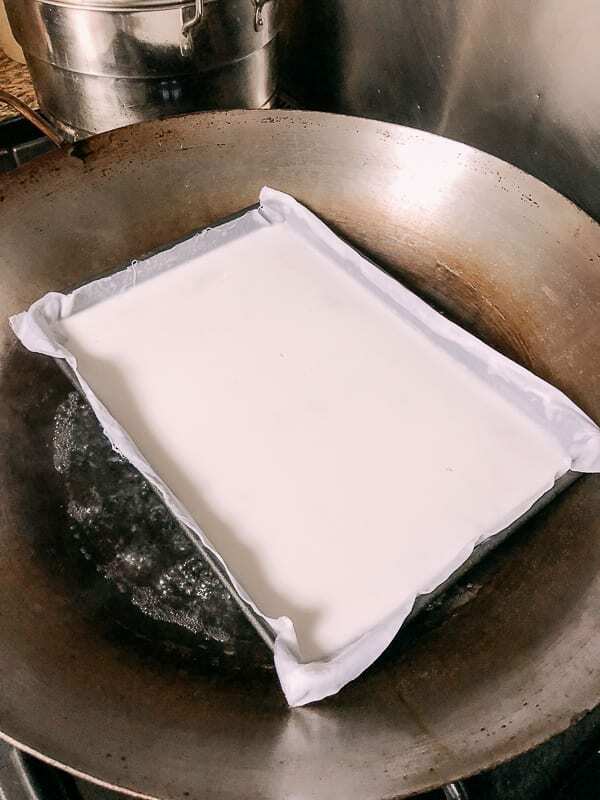 This recipe makes 2 full sheets of rice noodles in this sized pan (equivalent to almost 3 dim sum orders). First, place the shrimp in a single layer on a plate, and steam them for 2 minutes. Remove them immediately and set aside. Stir the rice flour liquid mixture well again before adding just enough to cover the cloth at the bottom of the pan completely. Too much will make the rice noodle too thick. 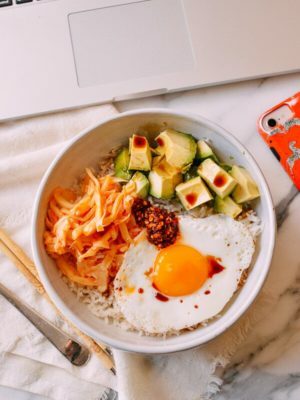 With the water in your steamer boiling, use the plate gripper and carefully lower the pan into the steamer (MAKE SURE THE PAN IS PERFECTLY LEVEL, or the noodle will be too thick on one side and too thin on the other), immediately cover the lid and steam on high for 2 minutes. Then remove the pan from the steamer with the plate gripper and position it next to your assembly station. 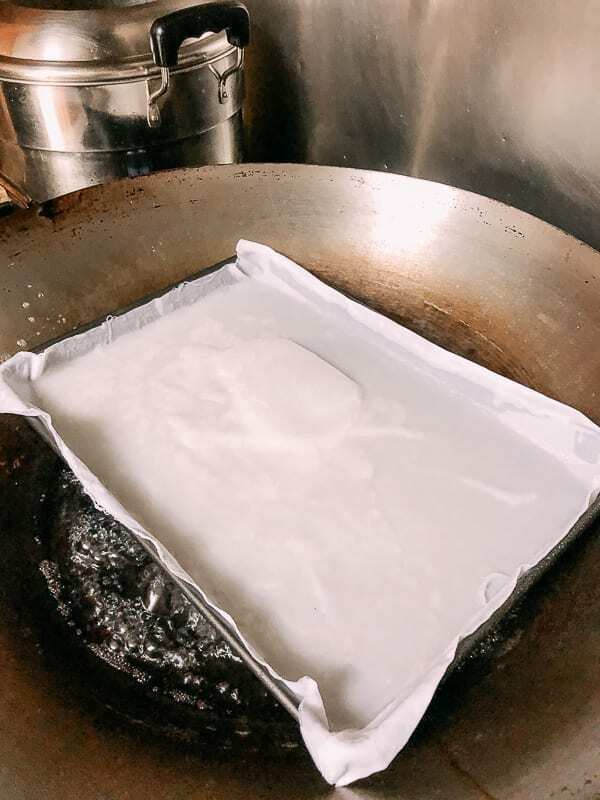 Carefully lift the cloth out of the pan, and place (rice noodle side down) onto the oiled surface. 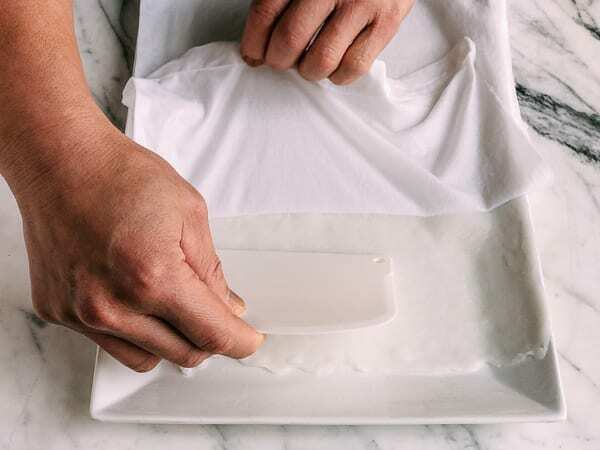 Use the dough scraper and carefully scrape the rice noodle sheet off the cotton cloth onto the oiled surface. Scrape and peel off the cotton cloth at the same time. This step must happen quickly while the noodle and cotton cloth are still hot. The noodle might have a small hole here or there––don’t fret. It does not affect the overall end result. 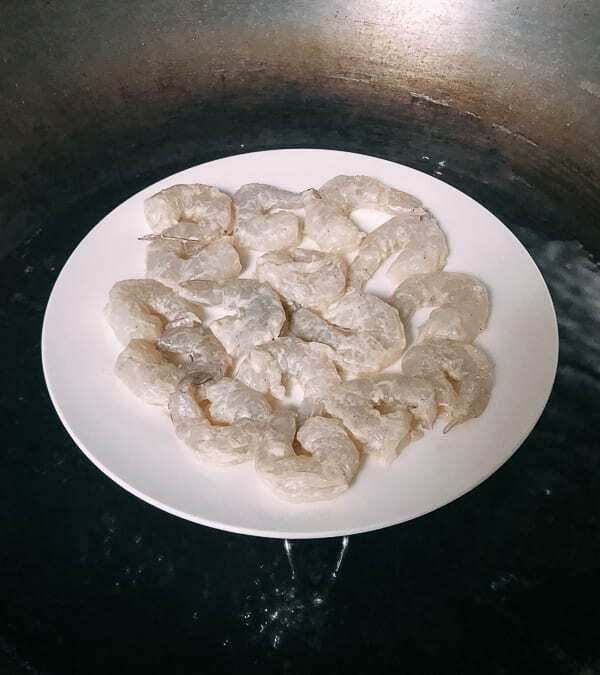 Cut the rice noodle in half crosswise and line up four cooked shrimp along the edge of each piece. Roll the rice sheet using the plastic dough scraper to wrap up the shrimp. At this point, you’ll have two long rolls. 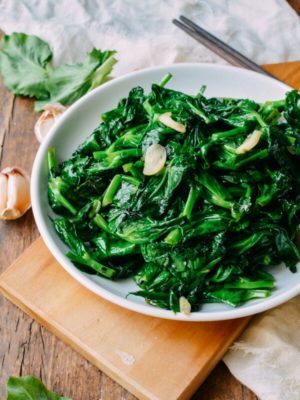 Cut each in half, drizzle with the prepared sauce, and eat it while it’s hot. Rinse the cotton cloth in clean water (no soap or detergent necessary) to remove rice residue before making the next one. These are best when fresh. In this case, we discourage leftovers! 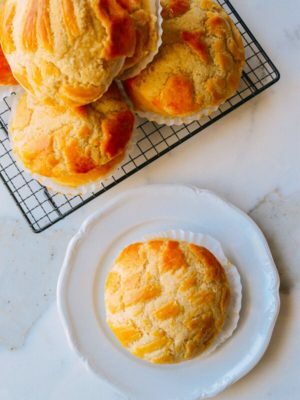 Good thing the rice batter is so easy to make! 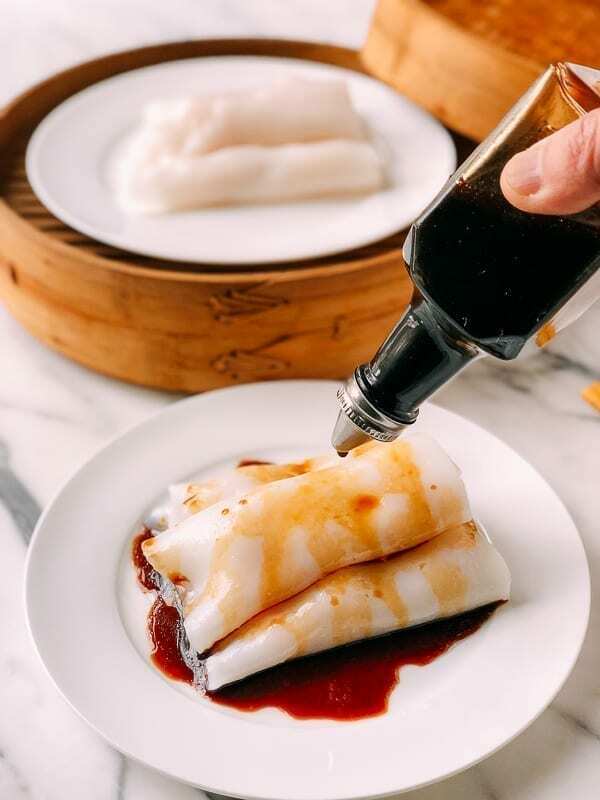 Shrimp Rice Noodle Rolls, or “ha cheung” are a dim sum classic, and consist of light rice noodles, or cheung fun rice noodles, wrapped around plump shrimp, doused in a sweet soy sauce. Toss the cleaned shrimp with 2 tablespoons water, ½ teaspoon sugar and ⅛ teaspoon baking soda. After the shrimp have been coated, cover and refrigerate for 2 hours. 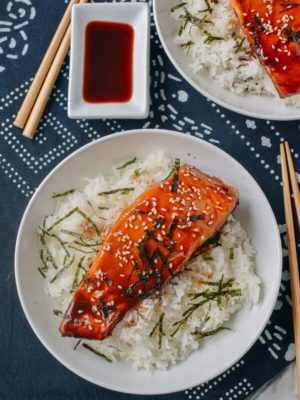 Marinate the shrimp with ¼ teaspoon sesame oil, a pinch of salt, ½ teaspoon cornstarch, and ¼ teaspoon ground white pepper. Cover and return to the refrigerator while you prepare the rest of the ingredients. Prepare the sauce by adding all the ingredients to a small saucepan over medium low heat. Heat the sauce until it begins to simmer, and turn off the heat. Cool completely and remove the ginger and scallion. 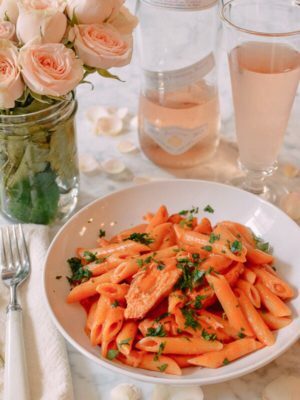 You can store this sauce in the refrigerator for up to 2 weeks. Combine the rice flour, mung bean starch, wheat starch, cornstarch, and salt in a large mixing bowl. Add the water and stir for at least three minutes until dry ingredients are well dissolved. Set aside and allow time for any air bubbles to dissipate. Soak the cotton cloth in water so it’s completely saturated. 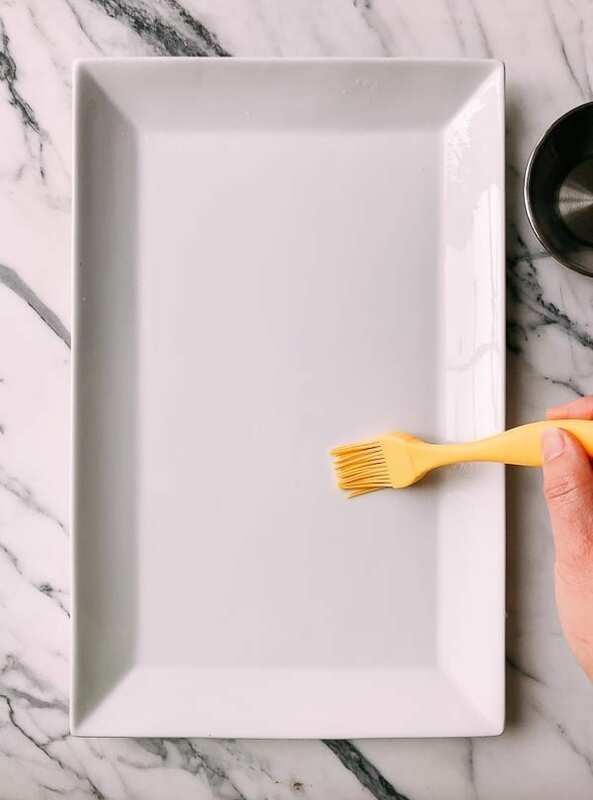 Prepare a large assembly station by brushing some oil on a clean, smooth surface like a non-porous countertop, a large flat plate, or a smooth cutting board. First, place the shrimp in a single layer on a plate, and steam them for 2 minutes. Remove them immediately and set aside. 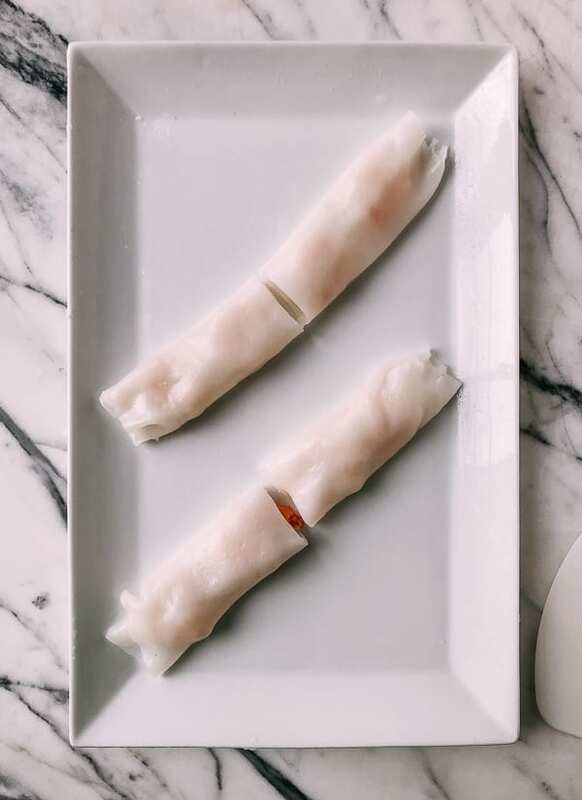 Cut the rice noodle in half crosswise and line up four cooked shrimp along the edge of each piece. Roll the rice sheet using the plastic dough scraper to wrap up the shrimp. At this point, you’ll have two long rolls. 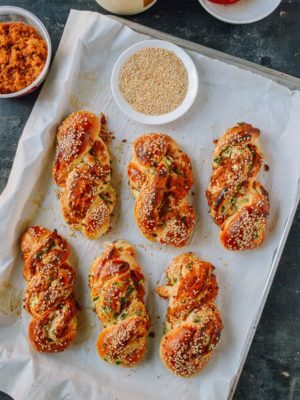 Cut each in half, drizzle with the prepared sauce, and eat it while it’s hot. 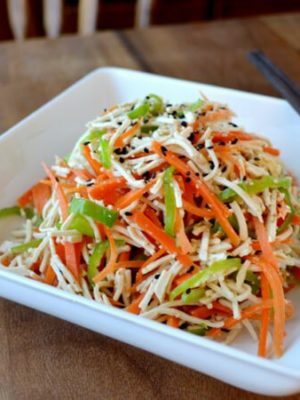 - This recipe calls for mung bean starch, which is a rarely seen ingredient (and many rice noodle recipes don’t call for it). However, this starch is a main ingredient in glass noodles, and I think it adds a nice texture and chewiness. - The dry ingredients in the batter will settle to the bottom of the bowl, even after being well-mixed. It must be stirred up every time before being added to the pan to steam. This is VERY IMPORTANT! - The shrimp marinating steps will make your shrimp more plump and crunchy. Skip only if your shrimp is extremely fresh. I couldn’t find any mung bean starch but I did find mung bean flour and mung bean powder. Are either of them equivalent to mung bean starch? Hi Albert, mung bean flour is not right, but I think mung bean powder is right after doing some research online. 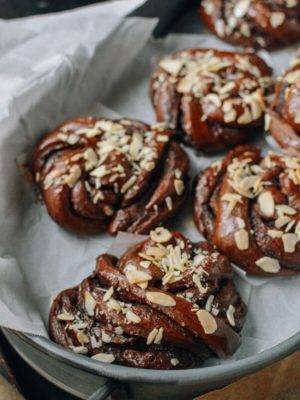 Absolutely love the site and always look forward to your recipes in my inbox – keep ‘em coming! Fantastic, just like China Town in New York, only much better. 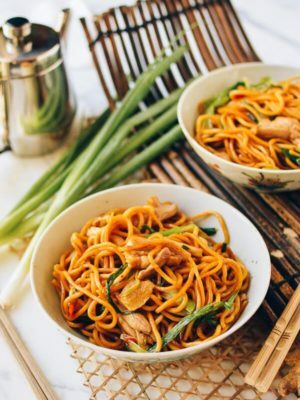 I found out that the addition of lye water (like they do in won ton noodles) was the key ingredient to the glossy appearance and slightly chewy texture, but I was reluctant to add it to my noodle batter as I am trying to eat healthier, so your use of mung bean starch is an epiphany! 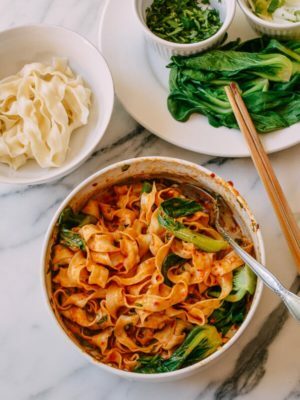 I might even be inspired to try making fresh won ton noodles with the addition of mung bean starch to get the right texture. Hi Ana, really!? but the lye water can turn the dough mixture a yellow hue, so that can’t be right. You’re right, my apologies, I did mix it up, it was borax, not lye water. Still an undesirable ingredient. I have trouble thinking that something I use in my laundry or for cleaning should be in my food……I just ordered my mung bean starch and will give it a try. Hahaha, Ana, lye water also comes in food grade. I read this with much interest. As I too have have been trying to master this skill. 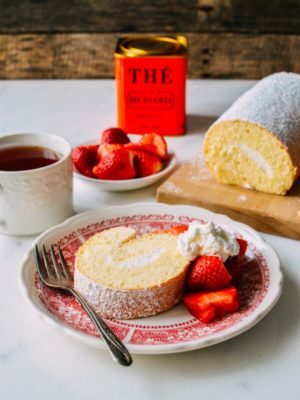 I have used or tried many methods, from steaming in aluminum cake pan, to ceramic pan to cast iron skillet to microwaving. I did not try the cloth method. Each with some success but not happy with them. I continued as one who has master crepes with a very thin batter, I was determined to be successful. I watched so many YouTube videos Finally Vietnamese lady who laughed at my determination and gave me her recipe. I was successful I also found you have to work quickly. Have everything ready to go! Let the batter sit! But also the temperature of your skillet is important. I had used a larger cast iron skillet before, this time a much smaller one which was easier to flip over. Thanks for this. 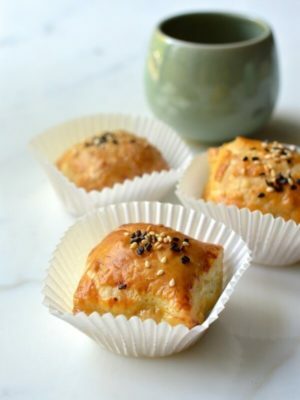 Wow, your recipe gives me a new appreciation for this dim sum favorite! Not sure I will actually make it myself but I really enjoyed reading it. The photos are both awesome and helpful, as always! Glad that you enjoyed the reading, Debbie! 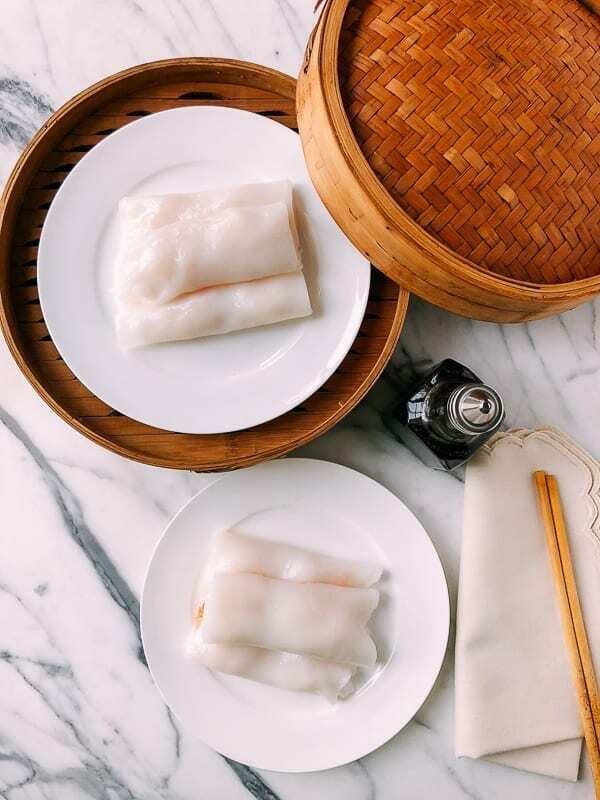 Can you buy the rice noodle sheet already made? You can if it’s available. But the texture of the rice noodle sheets that you are talking about are thicker and chewier. They are for stir-fried noodle dishes. 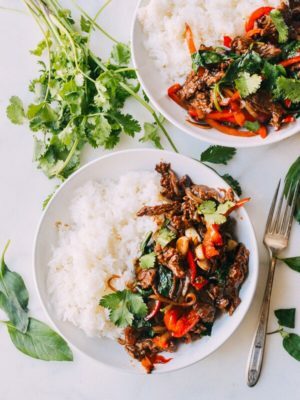 What size is your wok to fit a 9″x13″ sheet pan? They look wonderful! I will always think of this post when I order this at dim sum! Hi Cynthia, my wok is pretty big. It came with my Viking stove. But this method works with a smaller tray and smaller wok or steamer. Who would have guessed how tedious this unpretentious dim sum favourite is! Good on you for figuring this out…I’ll enjoy every bite more at Yum Cha! Thank you!